About this post: In a beautiful episode of wildlife conservation in India, Mangalajodi – a village on Chilika lake in Odisha – has shown the world what wildlife conservation efforts can achieve in the space of ecotourism in India. Now a bird sanctuary in Odisha, Mangalajodi was once a village of poaches and not really among Orissa places to visit. Read about this incredible wildlife sanctuary in Odisha and plan a trip with Mangalajodi tourism. My complete Odisha travel guide is coming soon! “Asian openbills were the most delicious,” he said. Sun-burnt face, shy smile, eyes fixed at the adult storks far in the distance. I looked at him with some incredulity. We’ve been so attuned to thinking that it’s ‘normal’ to eat some animals and not others, that it felt strange to hear my birding guide confess his favorite meal was a rare bird. It was my second morning in the state of Odisha (previously called Orissa) on India’s east coast, and I was gliding along silently on a rustic, wooden row boat on the gentle waters of Chilika Lake – India’s, and Asia’s, largest brackish water lake. I was trying hard not to gasp at my guide’s words. And harder, trying not to imagine black godwits and wood sandpipers, with twisted necks, ready to be cooked. Until over a decade ago, the primary livelihood of nearly a hundred families in Mangalajodi was based on killing, selling and eating birds – many of them migratory, from far flung parts of the world like Siberia. Over the years, the migratory birds that flew to the marshlands of Mangalajodi in winter instinctively sensed the danger, and their population gradually declined. The lack of awareness and alternate livelihood opportunities earned the local bird poachers and their village a shameful reputation, one that would gradually inspire an incredible transformation. I remember chatting with an elderly man on a rainy afternoon in Mangalajodi, as we both took shelter under a tree. Even though he had been a fisherman all his life, he took pride in talking about the transformation of his village. Legend has it that the transformation of Mangalajodi began with one man’s repentance. That man was Nanda Kishore Bhujbal from the surrounding Tangi region, and he was overcome with guilt the first time he shot an Egret with an airgun – almost a coming of age ritual in these parts. He decided to personally renounce poaching and stood up to the most notorious poachers in the area, once even at knife point, ultimately creating the Mahavir Pakshi Suraksha Samiti (a bird protection collective), which was the beginning of a long, painful transformation in the village. The year was 1997 – and the challenge wasn’t just about changing mindsets, but offering sustainable alternative livelihoods. Enter the concept of eco-tourism, facilitated by an organisation called Indian Grameen Services. Bhujbal’s persistence gradually won over the rest of the poachers, and in a local temple, they pledged against killing their winged guests. Several organizations (including Wild Orissa and Royal Bank of Scotland) joined hands to train the poachers to become birding guides, impart basic English skills and equip them with the ways of the hospitality industry. Delicious vegan food at Mangalajodi Ecotourism. It all made sense on the marshlands as we rowed along, as my guide rattled off the names of migratory birds and related stories of their breeding and feeding habits – the poachers knew their prey so well, it only made sense that they would make excellent guides! And indeed, twenty years later, the guide and boatman I was sailing down Chilika Lake with, were both ex-poachers. 85 families in Mangalajodi make their living through tourism now. By day, they work as birding guides, boatmen and hospitality staff. By night, they patrol the marshlands for any illegal poaching, since protecting the birds is their primary source of livelihood. The birds have noticed the transformation in Mangalajodi too: over the years, the migratory bird population has grown from 5,000 to 3,00,000 per year! Although the transformation of Mangalajodi’s infamous poachers is remarkable, only a short walk around the area made me realize that issues like poverty, sanitation and open defecation continue to plague the village. 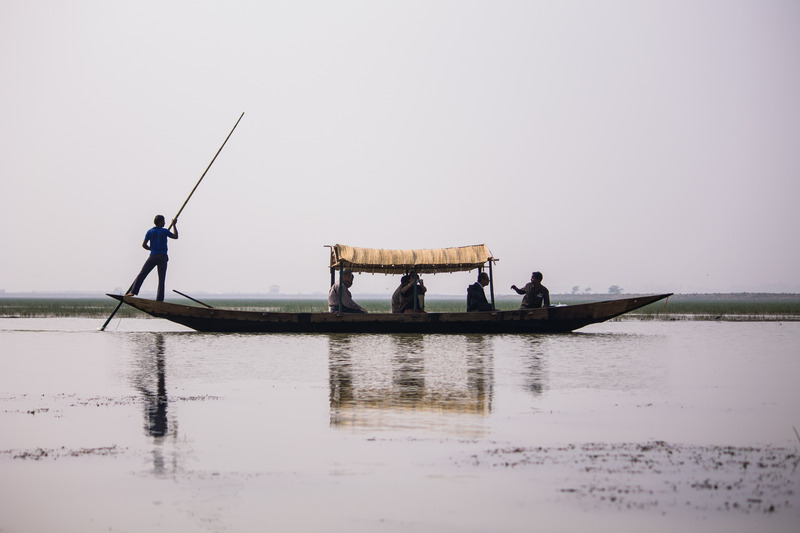 But as we rowed away on our wooden canoe, deep into the marshlands, and I observed my ex-poacher guide and boatman intently spotting birds, it struck me that if there is one place that gives me hope that no change is impossible, it is Mangalajodi. A fisherman in the marshland of Mangalajodi. How to reach Mangalajodi: Take a flight to Bhubaneshwar, from where Mangalajodi is an easy 2 hour drive. Where to stay in Mangalajodi: Stay at the community-run Mangalajodi Ecotourism Campus to get an insight into the transformation of the village. The facilities are pretty basic, but the food is delicious and the conversations thought-provoking. Best time to visit Mangalajodi / Chilika Lake: November to February is the best season to see migratory birds. A note on speciesism: The idea that we shouldn’t discriminate based on species, puts in perspective Mangalajodi’s attempt to stop the poaching of birds for food, but not fishing. While 85 families in the village now earn their livelihood through tourism, nearly 750 families continue to rely on the waters of Chilika Lake to kill, catch, sell and eat fish. Why are we so attuned to thinking that it’s ‘normal’ to eat some animals and not others? Have you come across any inspiring stories of wildlife conservation in India? Connect with me on Instagram, Facebook and Twitter for more responsible travel adventures. Subscribe to my exclusive newsletter to receive travel inspiration in your inbox! This Man Felt Guilty about Killing a Bird. So Saved an Entire Bird Sanctuary! Love your writing. Scenes like this is why India is such an incredible place. Thanks for sharing such a nice article. Keep up the good work. Love the way you write this article. Thanks for useful information. First picture posted in the write up is not of an Asian open bill rather it was of a flock of cattle egrets. Thank you for sharing your experience and these amazing bird photos. I agree that a sustainable alternative lifestyle for the local population is the key to preserving these beautiful creatures. In Borneo, a Dayak told me that all the animals around his village had been hunted and killed. When a man is hungry and without money, who would do any different? But if there is a different way, then there is hope. Wonderful, hopeful story. Have not heard the term speciesism but have often thought of the concepts it represents. Thanks for the enlightenment. Its easy to preach somebody, but preaching goes down only on a full stomach. Really heartening to see an entire village being transformed by a man’s hard work. Thanks for bringing this story to us. What a hopeful story of transformation! Your note on speciesism is something we all need to understand and act. Hi Shivya , it’s really nice to read your blogs , they are so much inspiring and motivating. But seriously I wanted to ask you a question , but it’s not about this blog , but over all , when you travel abroad then how you manage with your visas and all that stuff ??? I mean do you get them well in advance or in the last moment we can get them too ? I belong to Odisha. I have visited Mangaljodi several times with family. Reading your article makes me feel as if I have never observed it so closely. Thank you so much for this insight Shivya. Really a good and complete article, full of ideas and inspirations ! such a nice travelling information. real humans, love for them and thanks for sharing such a wonderful blog. Previous PostAll The Vegan (and Vegetarian) Food I Loved in Salzburg, Austria! Next PostAn Unfinished Affair: Places I’d Love to go Back to Someday.